Three-day faith and freedom event features Diamond Rio, Lee Greenwood, Larry Gatlin, The Crabb Family, The Isaacs, Canton Junction and more. 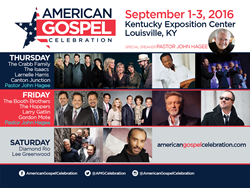 Pastor John Hagee will keynote the three-day, star-studded American Gospel Celebration Sept. 1-3 in Louisville’s Freedom Hall at the Kentucky Exposition Center. This event is not only a celebration of our faith and freedom but also honors our military veterans. Top artists set to perform include Grammy and Dove Award-winning Diamond Rio, Lee Greenwood, Larry Gatlin, The Crabb Family, Canton Junction and many more. Aspiring gospel singers (not signed to a record label) who dream of a shot on stage can win a chance to perform at the Tailgate Event and receive a free ticket for each performer to the Celebration. Just post a solo or group vocal performance on social media (unlimited entries) and use hashtag #agctalentsearch. See americangospelcelebration.com for eligibility rules. Friday features a second Tailgate Event, more inspiring preaching from Pastor Hagee and music from Booth Brothers, The Hoppers, Larry Gatlin, Gordon Mote, and Voices of Lee. The event comes to its big finish Saturday, Sept. 3, with musical performances by Diamond Rio and Lee Greenwood.